This time, I’m infusing traditional Chinese dishes with the flavors of Harlem. Beef short ribs celebrate the African-American soul food tradition, while bacalao with glutinous rice is inspired by the Latin flavors of Spanish Harlem. Tea smoked duck cooked in the French style – seared and served rare – represent European cooking traditions. Then there are the mooncakes. Since mooncakes can be filled with almost anything, I really had a wide range of choices. My final All-American fillings include maple walnut, cherry almond, and Earl Gray tea. But the one that I thought everyone would like is the apple cinnamon-filled mooncake, which used the ingredients of the good old All-American Apple Pie. 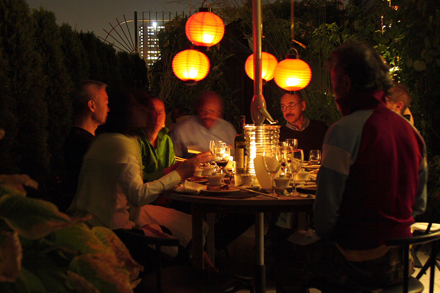 Dining outdoors for the Mid-Autumn Festival celebration is a tradition that’s been practiced for centuries. Known as “shangyue” (賞月), families gathered under the full moon while enjoying a meal and mooncakes. Unfortunately with the urbanization of China this practice is waning. 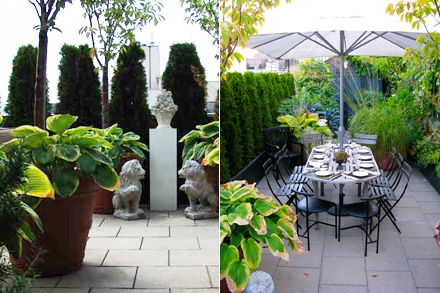 In the spirit of reviving this tradition I chose to hold this event at the Harlem penthouse garden of Nobu Otsu and Joe Healy. Nobu has a supreme passion for gardening. In his rooftop terrace he has created an Eden-like garden complete with espaliered apple trees, pear trees, grapevines, berry bushes, a full vegetable garden, as well as a spectrum of flower gardens. Nobu not only has a passion for gardening but also has the same passion for wine. He owns The Winery, a boutique wine store, in Harlem. He agreed to help me pair wines for the Banquet. In keeping with his all-natural and biodynamic gardening philosophy he selected some very exciting biodynamic wines from different parts of the world. To help me execute this full ten-course meal Dalia Jurgensen agreed to assist me in the kitchen. Dalia has helped me present a few of my Private Chinese Kitchen events, where I offer a traditional private dining experience in Harlem. Dalia was a pastry chef at Nobu, La Cote Basque and Veritas in New York. Dalia is also writing a memoir about working as a pastry chef in New York to be published by Putnam in the spring of 2009. The book is called SPICED: Salty Chefs, Bitter Waiters and My Sweet Life As A Pastry Chef has been described as a sort of Kitchen Confidential meets Bridget Jones diary. With a credential like this I know I will not have any trouble with the cooking. Now the only other help I needed was someone to take photographs. What would a food blog be without gorgeous pictures? So I enlisted my friend Ron Boszko, a photographer extraordinaire whose studio is right next to my office. With Ron’s help I was able to concentrate on cooking and serving our guests. To round out the guest list I invited Sheron and Joe Barnes as well as Wendy and David Chan. Sheron is the proprietress of MoBay restaurant and Baton Rouge in Harlem. Sheron was a pioneer in revitalizing the new Harlem. Her restaurant was one of the few that opened up when Harlem was still shunned by many New Yorkers. Wendy is the president and founder of Definity Marketing a marketing consulting firm with a large portfolio of Asian brands and products. Our guests arrived at dusk in time to enjoy the garden in the sun’s fading light. Nobu served a beautiful sparkling cider, as aperitif, from Eve’s Cidery located in New York State’s Finger Lakes district. It was flavorful yet dry with a very nice fruity aftertaste. Sheron observed that it was a pleasant surprise when compared to many often too sweet versions of sparkling cider. By the time we started the cold dishes it was getting dark, so we lit the traditional red paper lanterns and began our dining extravaganza by the flickering candle light. 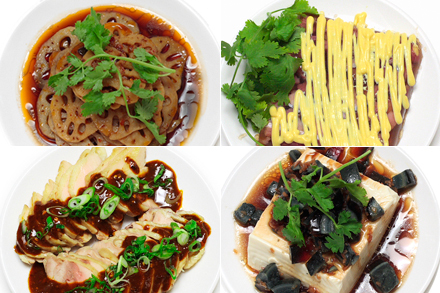 The cold dishes consisted of Lotus Root Salad with Spicy Dressing, Ham in Wine Aspic with Mustard Mayonnaise, Cold Chicken in Spicy Sesame Sauce, and Tofu with Preserved Egg Topping. These are mostly classical dishes except for the Ham in Aspic, which I replaced a cured pork recipe with ham and added a mustard mayonnaise topping to give it a little zing. After the cold dishes I served a shrimp and scallop stir-fry. Each shellfish was made with a different sauce. 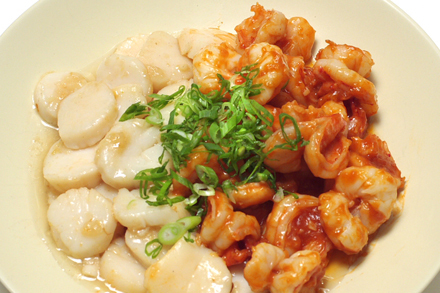 The shrimp was in a tomato sweet and sour sauce while the scallop was in a simple white garlic sauce. The contrast between the two sauces brought out the wonderful seafood flavors. Nobu paired these two courses with a 2005 biodynamic Riesling from Preiss-Henny of Alsace. This Riesling was clean with a very smooth fruitiness that beautifully compliments both courses. Next I served the Tea Smoked Duck, which I interpreted in two ways. 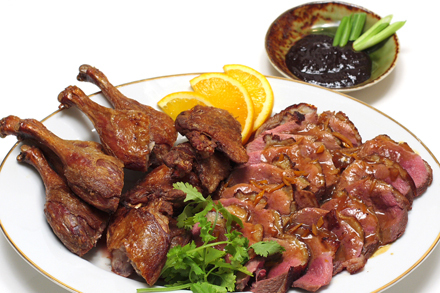 The duck legs served in a traditional crispy Chinese version accompanied by sweet bean paste, and the breasts were served seared rare with an orange star anise sauce. The contrast of the two sauces reminded me of how multi-cultural culinary tradition can enhance such great experience in flavors. I followed the duck with another modern interpretation of braised short ribs. I based this dish on the soul food tradition but braising the meat in a Chinese sour plum preparation. 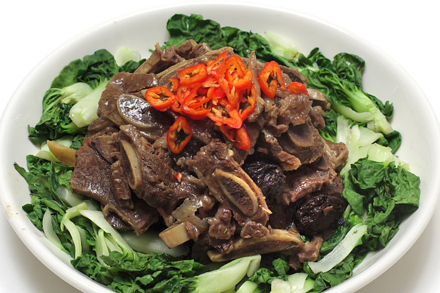 The cut of short ribs I used was based on Chinese method however. The ribs were cut thinly across the bone resulting in bite size pieces that could be easily handled by chopsticks. The flavor is fruity and sweet with hints of ginger. Now for these two darker meat dishes Nobu aptly paired a full bodied 2006 South African Pinotage blend from Kanonkop. This wine was full of berry flavors yet had very complex smoky rich flavor that I thought was the perfect accompaniment for the duck and the short ribs. For soup I decided to serve a frog broth scented with chrysanthemum, which is a classic Cantonese preparation for chicken soup. I selected this soup to highlight the autumn chrysanthemum as an ingredient. The soup had a slightly bitter herbal flavor that is great as a mid meal palate cleanser. Of course I could not offer a banquet without my signature dish of Red Cooked Pork. I presented it with the customary steamed buns. As always it was a hit and I was amazed at how the meat just disappeared along with second servings of steamed buns. To accompany these two milder flavored dishes Nobu selected a 2006 Vouvray Chenin Blanc from Chateau Moncontour. This wine had a smooth low acidity taste that blends almost seamlessly with the soup while contrasting with the pork belly. I served winter melon for the vegetable course. Just like tofu, winter melon is very much tasteless and will absorb flavors from any cooking liquid. 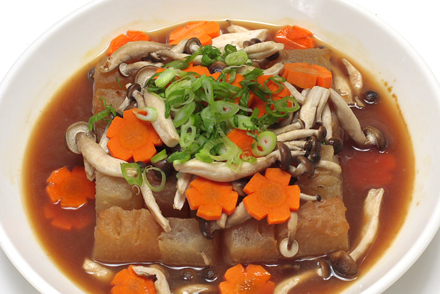 So I prepared a deep rich broth from dried scallop and finished it with mushrooms and carrots. When you bite into the melon a burst of complex flavors is released. 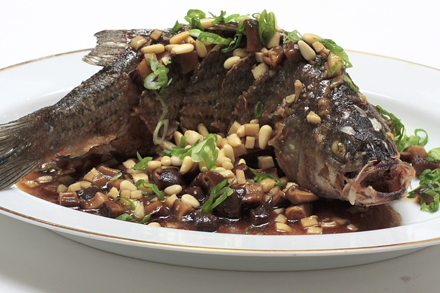 We now reached the fish course and I decided to serve a wonderful version of sweet and sour sauce on a deep fried whole sea bass with pine nuts. 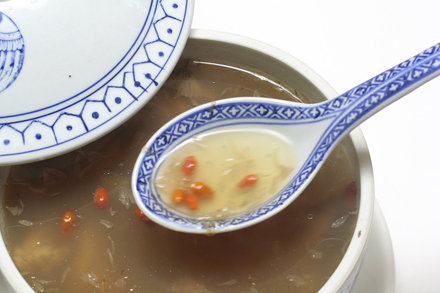 This dish was based on a traditional Zhejiang dish. Instead of a traditional Chinese yellow fish I used fresh American sea bass. What turned out was a moist meaty dish with wonderful nutty flavors. All the guests enthusiastically enjoyed this dish. The starch course was another one of my modern interpretations. 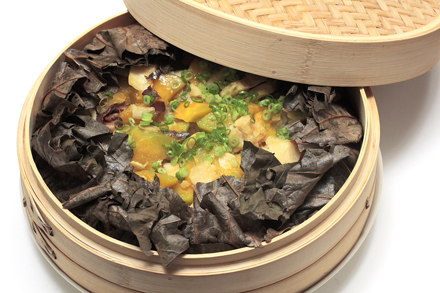 Glutinous rice steamed in lotus leaves with toppings is a common preparation in Southern China especially in Fujian province. I decided to use this technique and topped it with bacalao and pumpkin that was further flavored with Chinese cured bacon. For the final wine pairing Nobu chose a 2007 Bonny Boon Ca’ del Solo to accompany three courses. This fruity and mildly sweet biodynamic Muscat surprisingly was able to compliment all three courses successfully. I suspected that this was possible because all the dishes were seafood based. It was an excellent choice by all accounts. And finally I served my homemade mooncakes. I’ve made four different varietiess of filling for this banquet. They included Maple Walnut, Cherry Almond, Earl Gery Tea with Salted Egg York and Pine Nuts, and Apple Cinnamon. They were all American in inspiration but one that stood out was Cherry Almond as the favorites of the guests. As we wound down the dinner Wendy lamented how a Mid-Autumn banquet like this under a full moon is rarely experienced in Asia anymore. Maybe I will be able to catch the attention of the younger generation of Chinese foodies by showing a modern revival of an old tradition. 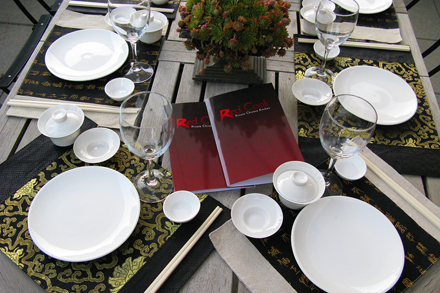 I had an amazing experience creating this menu, blending traditional Chinese with modern American interpretations, and fusing flavors, textures and aromas of many food traditions. It was evident from tonight’s lively conversation around the dinner table that there is a constant buzz about Chinese food and its role in American culinary scene. A good Food Buzz. Wow! Nicely done! Great idea having people help you too. I did all the prep, cooking and photography for my 24,24,24 event so it wasn’t nearly as elaborate as yours. I have to say I’m a bit jealous of your guests too, everything you made looks divine! Wow, what an interesting post; especially the comment about the global changes and tradition. I had been thinking about making moon cakes for a month; reading your posts really makes me what to make them right now. great job. Wow–bring on the autumn with this Harvest feast! I loved seeing such a spread. The moon cakes look fantastic. I love them, and I loved to see such a cool blending of culture. Great job! What a feast! WOW! I really like the duck. Recipe? What a fantastic feast – well done! Such a beautiful garden and I’m in love with the scallop and prawn stir fry – delish! Gorgeous post. I love the tradition & the marriage of flavours. Thanks for opening such a special window to your world. It’s beautiful…& BTW, look forward to the book release.I’m on the same wave length as Bridget Jones…LOL!! I am so very privileged to be invited to this “fabulicious” dinner. The food, the setting, the company – simply superb. Kian paid attention to every detail so the meal was thoroughly enjoyable. Many people in NY lament over the fact that there are not many refined Chinese dining places, that offer authentic and sophisticated Chinese cuisine. Most restaurants also do not have the luxury to “educate” their guests, so we see dishes served are often the same that fulfill the expectations of the average American diner. Kian took an approach to explain the tradition of every dish, and how he gave it a clever and thoughtful twist which is not only relevant but decidedly taking the cuisine one level higher. The magical setting on the roofttop was fitting and charming! You are so inspiring. I am having a dinner party on Friday and I’m going to start making your drunken chicken recipe on Wednesday. Your party looks super-stylish and I wish we could see close-ups of the menus you printed. what an undertaking! I have to try that Hong Shao Rou. And serious applause to Ron Boszko for doing your dishes justice! What a wonderful banquet you turned out. 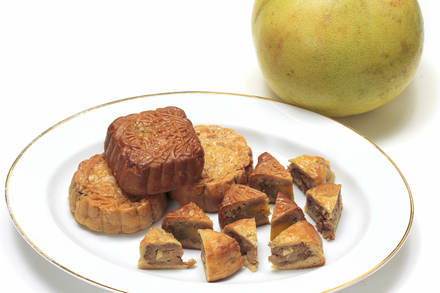 Cudos on the mooncakes, I think that was an ambitious undertaking, seeing as they are difficult to make. What a lovely gathering. I’m amazed at the menu — it all sounds so delicious. I can only imagine sitting there enjoying the lanterns and lovely setting. Very, very nice. Wow! What a fantastic meal. I would truly love to have dined with you. Our meals were so totally different! I am so enjoying reading through everyone’s meals. Yours looks like a real banquet. If I wasn’t busy cooking at my Iron Chef challenge on the other side of the country, I would have KILLED to be a guest at your dining table. What incredible food you served! Oh, to have had a bite of those steamed buns! What a pleasure to read your post! wow, it looked wonderful!!!! congrats!! great photos of the food, they made me hungry…..
Marc, I want to go to your underground restaurant. Marija, Fear not. I will start posting some recipe soon. Brooke, Next time you come to the other coast let me know and we’ll cook together. Great job Kian, the dinner looks very special. Love the maple mooncakes. The wine pairing looks perfect for every course too. Beautiful presentation. Your guests were truly fortunate. This sounds like an idyllic autumn meal and a true foodie learning experience rolled into one. Fabulous pictures. That menu looks great! This is the perfect time of year for such a feast. The duck really looks luscious. Cheers! Wow… That’s a very very elaborate feast. That ‘kong bak pau’ looks divine! I will love to try that frog leg soup too! Stunning. The menu is fantastic! I like how it’s still very “Chinese” although touched by “western” influences. Everything looks amazing! I love your reinterpretations. And that rooftop is gorgeous. WOW! Thanks so much for sharing. What an amazing dinner. Your food is positively beautiful. That looks truly incredible. Wonderful food, not sure where you put it all though! Next time I’m back home in NY I want some of those mooncakes! Fantastic — congratulations! What an inspiring feast. The mooncakes you made which combined Earl Grey tea with salted egg yolk and pine nuts have such a sophisticated blend of flavors…they must have tasted amazing! 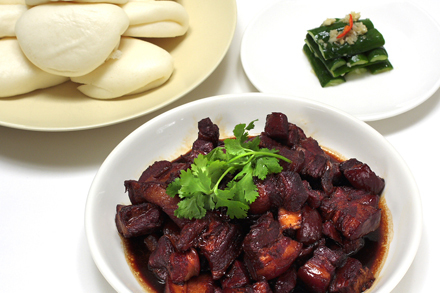 However, it is your recipe for the Hong Shao Rou (Red Cooked Pork) that is making my mouth water right now! Kian, I’m a bit late to this party, but that won’t keep me from drooling on the patio – er, the keyboard. Wow! What a mind-blowing feast for all the senses. I feel like I was there. And I wish I was. Your blog is lovely and full of magical things. Keep up the great work! WOW. I haven’t been home in many months and have been away to Wales for work the past few months so I missed the mooncake festival all together! You’ve been stumbled my friend, keep in touch, Its nice to see a chinese foodblog! That is a darn impressive menu! And each item look exquisite too. What a treat it must be for your guests, of whom I am very jealous indeed! Wow! This is an awe inspiring meal in a gorgeous setting. The dinner sounds so delicious. I enjoyed reading your blog. I am curious what you used to make your winter melon soup. Also, did you put the whole melon in (in the Chinese banquet style)? My winter melon has just been harvested and I am going to cook it this weekend — using seafood, ham, and mushrooms. Found your blog over 24,24,24 post. As a fellow chinese, I am super impressed with the effort you’ve put in for this banquet. I know how much hard work involved to create so many dishes, not to mention you even made your own mooncake!! I bow to you, si fu….